The American Society of Civil Engineers, ASCE, announced on July 24 the Thermal Integrity Profiler (TIP) as the 2015 winner of the Charles Pankow Award for Innovation. This Award celebrates collaboration in innovative design, materials, or construction-related research and development transferred into practice in a sustainable manner. The Award also rewards innovative approaches that help achieve at least one of the National Construction Technology Goals. The Award will be presented in March of 2015. The innovative TIP, which uses the heat generated during cement curing to assess the shape and integrity of concrete foundations, was recognized by ASCE in part due to the collaborative efforts that were key to its development. “The thermal integrity profiling technology was developed initially at the University of South Florida (USF) where it evolved throughout three Florida Department of Transportation funded research project”, said Gray Mullins, PhD, PE, the USF Professor who led the research team. A fourth study was performed in cooperation with Washington State Department of Transportation. 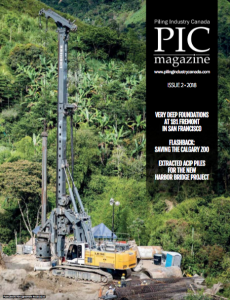 A joint effort was then undertaken by Foundation & Geotechnical Engineering, LLC (FGE), using the USF-licensed technology, and Pile Dynamics, Inc. (PDI). The 2 firms transformed the thermal integrity profiling technology into the Thermal Integrity Profiler. Asked about TIP’s contributions to achieve National Construction Technology Goals, Pile Dynamics’s Garland Likins, P.E., focused on the goal of Reduction on Project Delivery Time, explaining that current test methods of evaluating the quality of cast-in-place foundation elements are performed after the concrete of the foundation has cured, a process that takes several days. Typically, construction cannot proceed until foundations are approved. An evaluation performed with TIP may yield evaluation result as early as 12 to 24 hours after concrete casting, depending on shaft diameter. This aspect is only one of the advantages of this breakthrough testing procedure. Thermal Integrity Profiling is also less labor intensive than other integrity testing methods, and examines portions of the cross sectional area of the foundation that are in the ‘’blind zone” of those other tests. Exactly a week prior, on July 18, the Deep Foundations Institute announced that Prof. Mullins and his research team at the University of South Florida, were the recipients of the 2014 Ben C. Gerwick Award for Innovation in the Design and Construction of Marine Foundations. That honor was granted “for practical research on multiple subjects”, among them thermal integrity profiling of drilled shafts. For more information on the Thermal Integrity Profiler please visit www.pile.com/tip .